1. Read the General Information section, below. a) A brief Statement of Interest (limit 1 typed page) that provides information on academic background and interests, purpose for taking the field course, and goals to be achieved by participating in the course. b) A Letter of Recommendation from the student’s academic adviser, sponsor for the course or other professor. This letter should be confidential and sent in a sealed envelope independently or may be sent with the student’s application materials. We will accept letters sent directly to ITEC in a separate email. These letters may be provided to course instructors for final evaluation. 6. Pay your tuition. There are a few ways to make a payment. You can send us a check made out to ITEC and mailed to our office in Florida. You may pay by credit card through PayPal using our account: itec1@itec-edu.org. You may also pay by money order, mailed to our office or bank wire transfer. If you choose to pay by wire transfer, please contact us for the banking information. Field Courses. ITEC’s education programs offer field courses at the Bocas del Toro Biological Station during the summer and over winter break. Summer Sessions are approximately four-weeks (26 days) in duration. Winter session is three-weeks (21 days) in duration. These courses are available to all college students, study abroad students, postbachs, graduate students or faculty. For liability reasons, participants in all ITEC courses and programs must be at least 18 years of age. Course Size. Courses are limited to a maximum of 10 students each. Teaching Assistants (TAs) are provided to courses having more than nine students enrolled. Course professors have a PhD. in their area of study (or candidates), and TAs are pursuing Masters or PhD. degrees. A lab fee of $100 is required for Coral Reef Ecology classes and Tropical Ethnobiology classes. 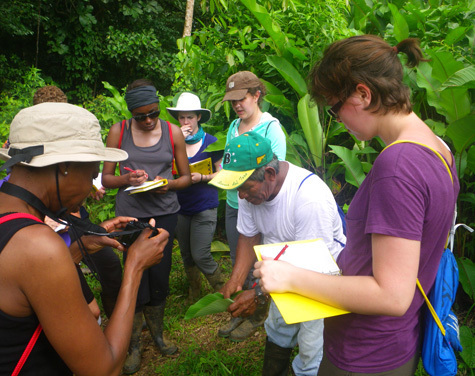 Course tuition includes all instruction, room and meals at the Bocas del Toro Biological Station, local transportation and the mid-session field trip to the Cloud Forest (see below). Tuition does not cover air fare or hotel costs to and from Bocas del Toro, Panama, emergency medical costs, soft drinks, beer or other snacks while at the station, or incidental travel expenses unrelated to courses. Obtaining credit. ITEC is a private institution and not directly affiliated with any university. Therefore, ITEC cannot issue academic credit directly. However, most universities have various mechanisms that allow students to obtain credit for field courses taken away from campus. These are often called “independent study” courses. If you are going to take the course for credit you must arrange this through your professor or academic adviser and university. In most cases this must be done prior to coming to Panama. When the ITEC course is over the course instructor and ITEC administrator will provide an official grade transcript to the student and his/her academic institution or adviser. The student will be responsible for providing direct evidence of course participation such as lecture notes, proposals, reports, exams, etc. It is up to the university how many credits to grant. Normally, up to six units of credit are awarded for each course, three for the lecture portion and three for the field portion. Please contact ITEC for details. Refund Policy. If you withdraw from your course within 30 days of the course starting date, all deposits and tuition will be completely refunded. If you withdraw from your course less than 30 days before the start of your course, only the portion of your tuition used for lodging, meals and local transportation ($500 plus any lab fees paid) will be refunded. This policy is necessary because enrollment numbers at 30 days prior to the start of each course are used to determine the hiring of faculty, teaching assistants, program directors and staff. Thus, we will have to expend your share of course cost regardless of whether you attend. Students wishing to withdraw late may use their tuition towards another ITEC course in a subsequent session or year. If ITEC cancels a course, all deposits and tuition will be completely refunded, or students may transfer to a different course, subsequent session or year. Course Cancellation Policy. ITEC reserves the right to cancel a course due to insufficient enrollment (five students minimally) up to within 30 days of the course starting date. Courses may be canceled at any time as a result of accident or severe illness of the instructor (when no replacement can be found). Cloud Forest Trips. To take advantage of other nearby tropical ecosystems, there will a field trip to Pacific-side tropical dry forest and to the cloud forests of Volcan Barú. At 3,475m (11,000 ft), this volcanic peak is the highest in Panama. This trip is three days and two nights in duration and includes a stay in the town of Boquete, and excursions to hot springs and to pre-Columbian petroglyphs. Transportation and hotel costs are included in your tuition. Food costs for this 3-day trip are the responsibility of the student and average about $10 per day. Visitors and others who are not enrolled in an ITEC class can join the trip by paying $100 to cover hotel and transportation. Important: If you are applying for a field course, Please include a $100 registration fee/deposit when your application is submitted. Your application will not be processed until this deposit is received. The registration fee/deposit will be applied to your tuition and is refundable to within 30 days of the course starting date. (See Refund Policy info, above.) All payments must be in U.S. Currency. Make checks payable to ITEC. If you’d like to hear what our previous students have to say, here’s a list.